There are a few things as fulfilling as seeing vast swathes of bright green grass or running barefoot on soft turf. That feeling is probably one of the reasons why lawns typically take up the most space in American yards. In fact, the average American lawn space is around 0.225 acres or around 10,000 square feet, ranging from 2,500 square feet up to 22,000 square feet. At times, or sadly, more often, our lawns look unhealthily dry, brown, thinning, or burnt while the grass next door looks as if it’s on grass steroids. If this is true for you, then you just might need the best lawn fertilizer for your famished lawn! 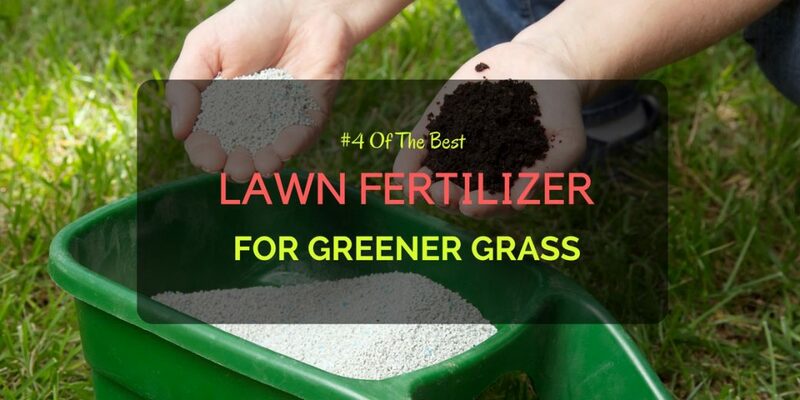 In this article, we’ll look take a look at the four best food for your lawn, things you need to know about fertilizers, as well as the factors that determine the excellent varieties. The statistics above also explain the enormous market for lawn food that is available to the public. Hence, for us to find not just the best fertilizer for your lawn, but also the best in value: we’ll need an in-depth look at lawnfood. Keeping your lawn healthy obviously takes more than just watering, sweeping, mowing, or trimming. Although these maintenance practices are also essential, choosing to feed your lawn with the right kind of fertilizer will be detrimental to its health and longevity, similar to any plant. Again, like any other plant, grass also needs nutrients. You could just go out and get a general fertilizer, but you should consider the specific needs of turf. For example, grass primarily requires nitrogen. This reason is why the majority of NPK lawn fertilizers are mainly made up of nitrogen. Nitrogen is chiefly responsible for the growth, fullness, and intense green color, in grass. So, a deficiency in nitrogen will lead to weak growth, thin brown turf, and a lower resistance to illness. Phosphorus, on the other hand, is responsible for root growth, health, and development. Hence, it’s vital for sod or young grass as it continues to grow. Mature grass, however, does not typically need high applications of phosphorus. Before you start talking to the grass on your lawn and asking it why it has turned a dry shade of brown, it would be wiser just to make use of a Soil Test Kit. Kits like these will help you know exactly what your lawn needs, whether it insufficient nutrients or improper acidity levels. Subsequently, you will then know the most appropriate type of fertilizer for your lawn. Then, branching out under these three categories are the controlled-release fertilizers, liquid or water soluble fertilizers, and finally, granular fertilizers. As the name implies, single-nutrient fertilizers feature one kind of element. Again, when it comes to grass, nitrogen is the nutrient of choice. On the other hand, multi-nutrient lawn food features several types of nutrients for plant health. In addition to the basic NPK mix, this type of fertilizer may also contain manganese, calcium, iron, and other plant-healthy elements. Lastly, when biological material, such as animal waste or plant matter, makes up a fertilizer, then it’s under the organic category. Although organic fertilizers may not be as nutrient-dense as its synthetic counterparts, these are usually more eco-friendly and are also safer for people and pets. If you notice our top four best lawn fertilizers, you’ll see that there are both granular, as well as liquid (or water soluble) options. Accordingly, take note that these two types have very different characteristics. For one thing, you would spread granular fertilizers by hand, or preferably, by a broadcast spreader. The spreader can be small enough to hold in your hand or big enough for larger lawn properties. Also, these tools ensure even and uniform fertilizer distribution. Although the majority of granular fertilizers feature a form of controlled-release, there are also quick-acting products available. Conversely, Liquid or water soluble fertilizers are typically fast-acting. Additionally, you would apply these kinds of fertilizers through a type of spray and hose system. Determining how often you fertilizer and how much is as important as using the right kind. It’sstandard advice to feed your lawn in spring when the soil reaches approximate temperatures of 55°F (13°C) and, generally, this is a good guide. However, a better way to determine when you should start fertilizing is inspecting the overall condition of the grass. For instance, if you see any signs of paleness, yellowing, or slow growth, then it may be time for a new application of fertilizer. Additionally, the soil test kit I mentioned earlier will be crucial in determining the right time to feed your plant. No matter how Ill, you would never give a sick person medicine more than whattheyactuallyneed. Similarly, avoid overfeeding your turf with too much fertilizer. Otherwise, you may end up with a burned turf. Even if your grass seems very ill, remember that frequent feeding is better than overfeeding. Generally, a good guide is to apply, at most, 1 pound of nitrogen per 1,000 square feet. Of course, this will vary depending on the NPK ratios in your chosen fertilizer. It would then be worthwhile to inspect the details and instructions on the packaging of the fertilizer. There, the coverage of the fertilizer is given in square feet. For example, a box of the Miracle-Gro fertilizer on our top 4 list has a coverage of up to 4,000 square feet. So, if you’re lawn measures 1,000 sqft, then one bag will be sufficient for four applications. Now, let’s get into the reviews of the top four lawn fertilizers! The Miracle-Gro is a quick release fertilizer that features high quantities of nitrogen as well as iron supplementation. This formula is perfect for the lawn the needs a quick boost in health and color. Moreover, one box is good for up to 4,000 square feet of turf. A risk of overfeeding or burning your lawn if insufficiently diluted. The Lawn fertilizer from Safer is an easy favorite. First, it covers up to 5,000 sq ft. Second, it contains an NPK ratio of 10-0-6 while staying completely chemical-free since it is made up of organic plant material. Hence, this lawn food is an excellent choice for those who want a low-impact fertilizer as well as people who have children or pets who frequent the lawn. The Turf Builder from Scotts is similar to a sound investment that keeps on giving. Due to its controlled-release granules, maintaining your lawn allyear round will be a breeze. At the same time, you’ll have thicker and greener turf. Lastly, you’ll have enough food for up to 5,000 square feet of turf. It’s controlled-release means a constant but appropriate supply of nutrients for extended periods of time. There you have it! Those were our top four lawn fertilizers. Tell us If you know more!